The Special Economic Zone Authority at Duqm won the strategic award for the best Arab government website, which reflects the high level of success witnessed by SEZAD\\'s website (www.duqm.gov.om), developed almost two years ago. SEZAD has been honored by the Excellence Awards Academy in the Arab Region - the regulatory arm of the Arab Web Sites Shield and the Arab e-government Shield, in a glittering ceremony held at Al Bustan Rotana Dubai (April 29, 2014), along with a number of other Arab websites, under different categories, including public and private sectors, at the eleventh session of the competition, which was launched 11 years ago. 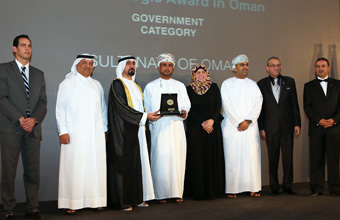 SEZAD\\'s Deputy CEO, Ismail bin Ahmed Al Balushi, expressed his delight at the prestigious award, as he said after the ceremony: \\'the Authority worked on the design of its website to provide investors with the information they might need and to help them make their decision to invest in the Duqm Special Economic Zone. The website also reflects the diversity of the areas covered by the comprehensive plan of the zone, the growth in the number of projects and the increased interest from the side of investors. As the largest event dedicated to websites in the Arab world, the \\'Arab Web Sites Shield Award\\' has been organized by the Excellence Awards Academy in the Arab region, in collaboration with Microsoft and the Business Software Alliance - Middle East for 11 years. The competition meant to award prizes for creativity in web design and development, further to showcasing the capabilities of the sites owners to demonstrate their creativity and talents. The initiative branched out several specialized competitions, the most important of which is the Arab e-government shield. It is worth noting that Excellence Awards Academy is the regulatory Body that undertakes the organization of such competitions. The winning websites have been selected on the Internet by a panel of Arab and regional experts and technicians, based on fundamental criteria, such as creativity, usability, site structure, interaction, aesthetics of visual design, as well as the content. Besides, the evaluation has taken into account the global standards laid down by the United Nations ESCWA. It is worth mentioning that over 325 websites from various Arab countries were present in the competition\\'s eleventh round and managed to meet the criteria laid down by the organizers.